Norway's new attraction has opened! Loen Skylift is located only 6 km from the Port of Olden, and will bring you from the fjord to the top of Mt. Hoven (1011 m) in only 5 minutes. Loen Skylift is one of the steepest cable cars in the world, and offer a breathtaking and unforgettable view of the Norwegian fjord landscape. Each cabin (two) have room for 35 persons. Loen Skylift run continuously during operating hours, without fixed departures. After 5 airy minutes, you arrive at the Mountain Station, and Hoven Restaurant where you will have a 210-degree panoramic view overlooking Mt. 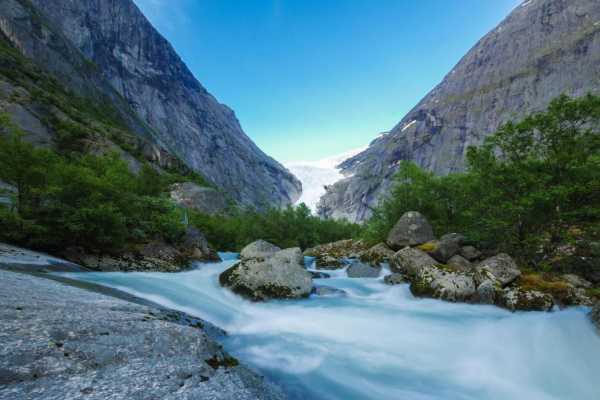 Skåla and Lake Lovatnet in the east, Jostedalsbreen Glacier and Olden in the south, and the Nordfjord that winds its way towards Stryn in the west. From Mount Hoven you can explore the mountain on your own in a comprehensive network of trails. On foot in the summer, or skiing or snowshoeing in winter. The possibilities are many – the choice is yours. Olden Adventure is offering a package including Loen Skylift and transfer directly to and from the cruise pier in Olden. Departures on the hour from the pier and every half hour from Loen throughout the day as long as the ship is docked in Olden is giving you as much time as you wish in Loen. Tickets for Loen Skylift will be handed out from our Olden Adventure office before boarding the shuttle bus. The office and the shuttle bus is located just outside the security gate. Open Top Glacier Sightseeing tour starts from the cruise terminal and heading for a glacier view point 12 kilometers from the village. At the view point there will be 10 minutes photo stop. The tour goes along the beautiful emerald green Olden Lake surrounded by high mountains, waterfalls and untouched nature. There are also several interesting views of old architechtural buildings along the route.